Gaze upon the city sights from the pinnacle of Chicago, the Skydeck. Located on the 103rd floor of Willis Tower, formerly Sears Tower -- the third-tallest building in the world -- the Skydeck offers spectacular sweeping views and is full of interactive exhibits. To complete your exciting Chicago experience, head to the Ledge, a glass balcony showcasing unbeatable views of Chicago’s top attractions like Wrigley Field and the Navy Pier. 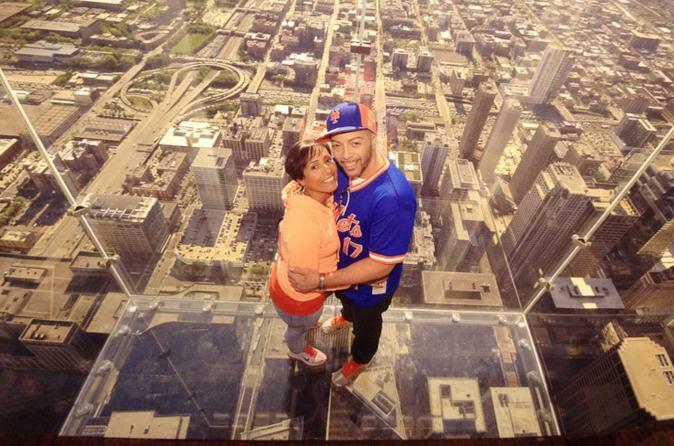 Marvel at Chicago from an unparalleled viewpoint during this exciting Skydeck experience. Located in Willis Tower, formerly Sears Tower, the Skydeck offers spectacular sweeping vistas of Chicago and beyond from the 103rd floor. Walk out onto the Ledge, a glass box-like balcony that extends 4.3 feet (1.3 meters) from the building, and experience an unconventional view--straight-down! Admire the lofty views of top Chicago attractions, like Wrigley Field, the Navy Pier and Millennium Park, all from a breathtaking height of 1,353 feet (412.4 meters). On a clear day, you can see up to 50 miles (80.5 km) out! It’s also the perfect vantage point for great sunset and twinkling nightscape views. Bring your camera or treat yourself to a professional photo available at the gift shop. You can also explore several exhibits designed for the whole family, like interactive digital floor displays, touch-screen activities, and scavenger hunts that not only highlight Chicago's iconic landmark, but also celebrate the Windy City's sports, architecture, pop culture, history, food, music, and people. Challenge yourself with a Chicago trivia game, compare the heights of the tallest structures in the world, and see just how many of your bodies it would take to reach the height of Willis Tower. Special Offer - Book with us and save 8% compared to another travel site! - Book Now!